Implementation science grant proposals require specific elements that are not common features in other grant types. Thankfully for those new to implementation science, to grant writing, or both, Dr. Enola Proctor and colleagues published an incredibly useful resource. Writing implementation research grant proposals: Ten key ingredients was published in the journal Implementation Science in 2012, and is a rich source of expert knowledge on writing successful grants in this young field. Below you will find a high level overview of this article, to serve as an introduction to thinking about this type of grant. The full article linked above is available open source - be sure to read it! In the "Webinars" section below, don't miss the video adaptation of "10 Key Ingredients", recently released by the Colorado Clinical and Translational Sciences Institute. Access/quality gap: It is not enough to simply document the burden of disease. Proposals need to demonstrate an unmet need, underuse or poor reach in the targeted population or low adoption, wide variation, or poor penetration of evidence based practices in usual care settings. 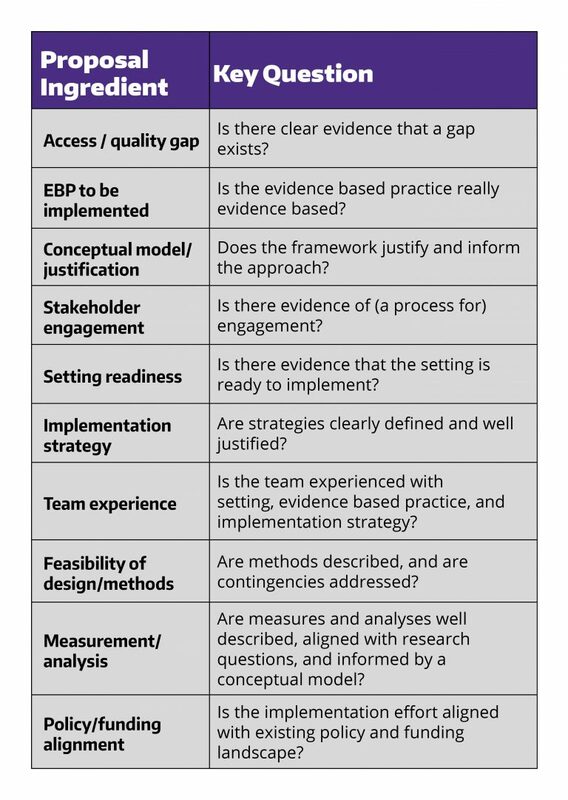 Evidence Based Practice: Must clearly establish that the evidence based practice is ready to implement. Strength of empirical evidence is key part of determining readiness, yet how much evidence is necessary is socially determined. Note the importance of evidence of effectiveness in targeted settings and populations. How much adaptation will be needed? Conceptual model: Active and intentional use of theory is needed to produce generalizable knowledge and situate the study within larger body of knowledge. This is particularly needed for specifying key contextual variables that influence implementation and the mechanisms by which strategies have their effects. A theoretically based conceptual model helps to frame study questions and hypotheses, clarify the constructs to be measured, and specify the relationships to be evaluated or tested. Stakeholder priorities and engagement: Engagement affects the impact of the proposed implementation effort, the sustainability of the proposed change, and the feasibility and ultimate success of the proposed project. Varying levels and forms of engagement are possible. The key is, have they demonstrated its impact? Setting readiness: Stronger proposals include information that reflects the setting’s readiness for change. This is especially true regarding the adoption and implementation of the proposed evidence based practice. Conducting a formal readiness assessment, formative evaluation of implementation facilitators and barriers, and letters of support from the setting that address the alignment of the proposed implementation effort with organizational priorities, policy, and funding context. Implementation strategy: Describe the strategy in detail (see our page Identify Implementation Strategies for more on this topic). Strategy selection should be justified conceptually and matched to known barriers (determinants) in the setting. Theory should be used to explain the mechanisms of action. The strategy should be robust, adaptable, feasible, acceptable, scalable and sustainable. It is important to know the cost and budget impact of selecting a particular strategy. Team experience: Does the research team possess all of the relevant expertise? Does the team have experience with the study setting, the evidence based practice, and the strategy? Feasibility of the proposed research design and methods: Is there preliminary or pilot data? Is the approach well described? Have potential problems and alternative approaches been described? Measurement and analysis: Does the conceptual framework inform the measures? Does the analysis plan align with the research questions? How well is the speed, quality, or degree of implementation captured? Is there appropriate attention to implementation outcomes not just clinical effectiveness outcomes? Policy/funding environment: Proposals that address how the implementation effort aligns with policy trends enhance their likelihood of being perceived as having high public health significance, as well as greater practical impact, feasibility, and sustainability.